The small castle, sitting at what is the unofficial entry point to the old town, has relics dating back as far as the 9th century, but the main structure was erected during the 15th century at the behest of the then Count of Ribadavia. As ruins go there is a reasonable amount of the original building remaining to look at and formal tours take place during the summer months every thirty minutes or so (in Spanish or Gallego). Externally the main features of the castle are a couple of turret like towers and the walls themselves. The castle is certainly worth a look, but would not warrant a visit on its own. 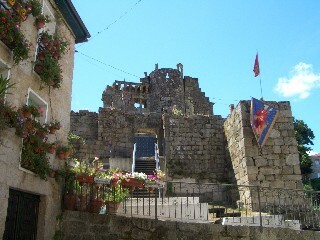 Other ancient parts of the town include the original town gates and sections of the wall which it is claimed may date back as far as the 12th century, but it is likely that most of what remains is from the later fourteenth and fifteenth centuries. The first area of Ribadavia with significant tourist interest is the area just above the alameda (main plaza) and opposite the castle. This top end of the town has a little hot spot with two interesting churches, the alameda and below that the castle. 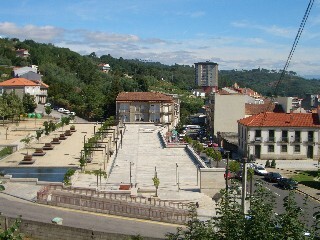 The present alameda is actually one of the newest areas of Ribadavia and sits opposite the castle. It is a hard landscaped area with a distinctive look, a water feature and an elevated location that gives it a good view of the castle and two churches behind it. It is nothing special in itself, but acts as a good marker for starting your exploration of Ribadavia. Two churches sit on an elevated area above the town’s alameda, one behind the other. The first, or a least the nearest one to the road, is called the Iglesia de Ntra. Sra. Del Portal. 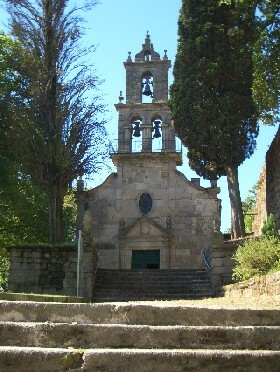 Built in the seventeenth and eighteenth centuries this is perhaps Ribadavia’s main church as it is dedicated to the town’s Patron Saint. The history of worship on this spot also pre-dates the church by three centuries when a hermitage originally stood in the churches current location. At the time of our visit the church was about to close (a common and annoying event in Galicia) and we were only allowed to venture in for a couple of minutes. The altar, which is baroque and typically intricate, dates from 1737 and the interior of the building equals the external facades. The second of the two churches at the top end of the town is the church and convent of Saint Dominic. This building sits to the side and slightly behind the one described above and is of a completely different appearance. You get to this church by climbing a flight of stone stairs where upon the simple front elevation and steeple await you. 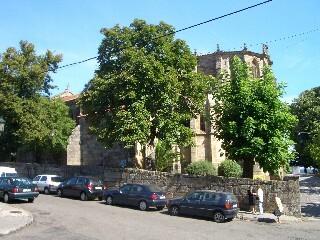 The oldest sections of this building are from the 13th and 14th centuries and the convent is of note because it was only the second one built by the Dominican order to be erected in Galicia. The convent was a center for learning and religious study for centuries, but with the selling of the property’s land ownership two centuries ago sections of the building were demolished and its use and occupation changed. The church is Gothic in design with sections and components of the structure dating from the 13th to 18th centuries. Interesting features include the column head details and some large coats of arms, one depicting the shield of the Sariento family (a beneficiary). In 1931 the church was declared a national monument.